New Year, New You? Are you determined to make 2018 the year you become healthier and happier? Tired of being ruled by dodgy digestion, horrible hormones, stuffed up sleep, bothersome breakouts, terrible tiredness or an immature immune system? The right supplement/s can help to stimulate and support your body to become more efficient at detoxifying, healing and producing energy by providing your cells with the raw materials they need, increasing cellular circulation, boosting metabolism, balancing hormones and helping your body cope better with the physical demands of living life in the fast lane. Whether you already have supplements at home that you keep forgetting to take or you’re planning on booking in to see our naturopath or herbalist, taking your supplements correctly can make a big difference in helping to ensure you get the results you’re after. 1. Take your supplements with food. Unless your practitioner has instructed you otherwise, always take your supplements with food to ensure that they are broken down and absorbed properly. Most vitamins and minerals need the stomach acid and digestive enzymes that are stimulated by food in order to be absorbed from your digestive tract. 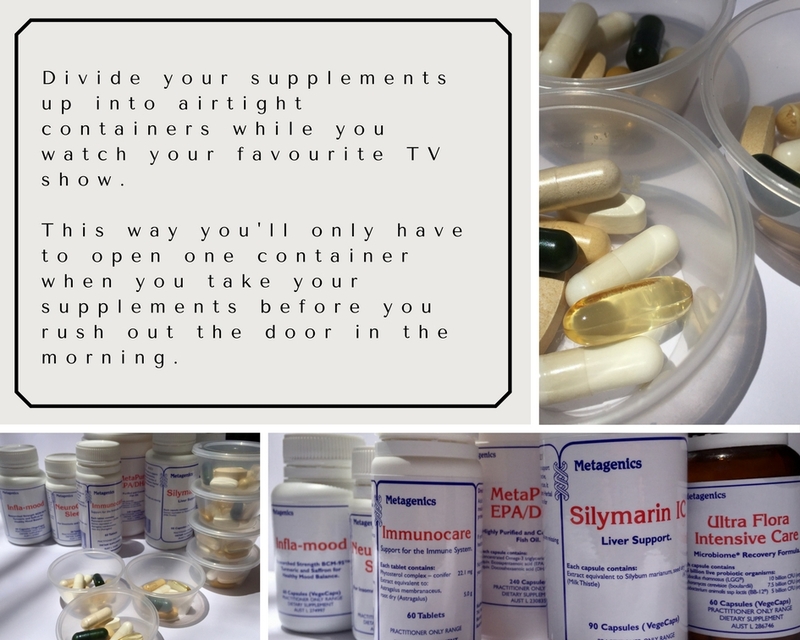 Throwing a handful of supplements down with a glass of water as you run out the door in the morning is one of the more common reasons for not getting the best results from nutritional and herbal supplements. 2. Out of sight is out of mind. Leave your supplements somewhere that you can see them and remember to take them. No matter how great a supplement is, it’s not going to do much for you sat in your cupboard. Probiotics are often forgotten, hidden away in the fridge. We now stock a high strength practitioner only probiotic that can be left out of the fridge for up to 30 days. 3. Choose high strength practitioner only products. Not all supplements are created equal, practitioner only supplements are formulated with quality ingredients and contain therapeutic amounts of active constituents. In many cases this means you actually need to take less and the formulations are based on years of clinical experience backed up with the latest research. For example, our practitioner only iron supplement contains the active form of folate, important for forming healthy red blood cells. Other iron supplements contain synthetic folic acid. Our iron tablet also contains a special form of iron bound to protein to ensure maximum absorption without causing constipation, bloating and upset stomachs like many other forms of iron. Australia has some of the best quality practitioner only supplements in the world. 4. Divide and conquer. Yes you’re busy and exceedingly time poor but don’t let that become an excuse for not looking after yourself. Divide your supplements up into small airtight containers or snack sized zip lock bags so you only have to open the one container when you’re in a rush. 5. The power of positive thinking. Write down in your own words the reason you’re taking each supplement, if you’re not sure, ask us to outline what each product is helping you with. Remind yourself every time you take your supplements how they’re helping you to achieve your goals. This not only keeps you motivated to remember to take your supplements every day but there is good evidence to support this type of visualisation actually making supplements, food and even exercise more effective. Expectations have a powerful effect upon any medicine or treatment, so why not harness this power and use it to your advantage? For example, if you’re taking an iron supplement, remind yourself each time you take it that you’re providing your body with the resources and materials to build healthier red blood cells to boost circulation and help carry more energy producing oxygen to every cell in your body. If you’ve been prescribed a herbal immune tonic, maybe try visualising that the herbs are turning your immune cells into super heroes to hunt down and bring justice to the viruses invading your body and making you sick. We stock a comprehensive range of practitioner only vitamin, mineral and herbal supplements including Metagenics, Bio Medica, Orthoplex, Mediherb and Eagle. We also have a comprehensive, fully stocked herbal dispensary and can formulate and mix herbal tonics specific to you and your individual health concerns. Whatever your 2018 health goals are we can help you achieve them. You’ll be pleasantly surprised how easy it is to start feeling and looking better when you work with a qualified and experienced natural health practitioner to help guide and support you to make healthier changes to your diet and lifestyle and prescribe the right vitamin supplements. Call or email us to book an appointment or find out more information on how we can help you.